Something wonderful happened today. I don't know if it was simply the selection of the theater, the holiday weekend, or that I've been going to movies at the wrong time. We went to a screening of "Ghostbusters" and there were maybe two dozen people in the screening we were at, but the theater complex, which has 18 screens was packed! It reminded me of twenty years ago when the weekend crowds at the movies would be thick with families and couples and everyone was in line for a ticket, concessions or the bathroom. After reading several stories this week about how miserable the box office was this summer, it was refreshing to see that the movie business did not look like it was dying. 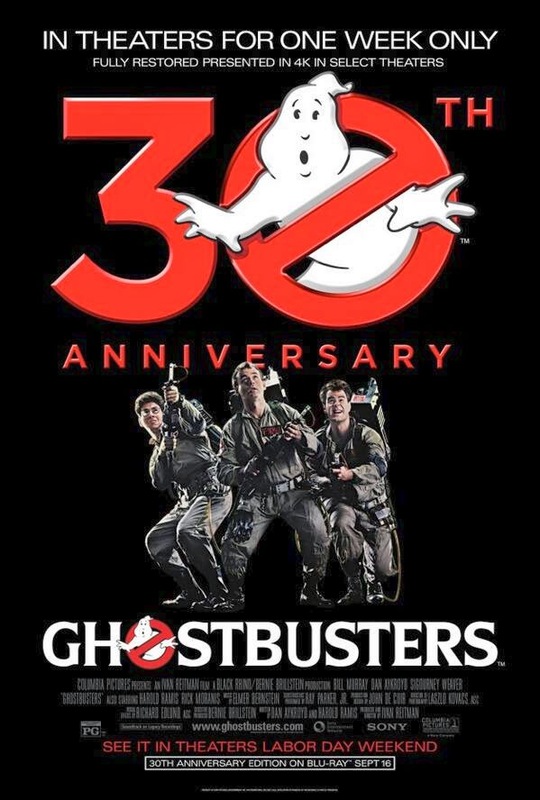 "Ghostbusters" is a movie that I covered extensively just a couple of months ago on my companion site, "30 Years On". For the full scope on the film you can click on any of the links on this page, including the poster below. Please come by and share your thoughts on that site if you can. I will say that the movie was again, great. Bill Murray is a national treasure. Also there are bits and pieces that you might notice on a forty foot screen that you miss on your home theater system. I noticed a second foreshadowing reference to the Stay Puft Marshmallow man that I missed before. There is a fading painted advertisement on the wall of a building that showed up much more clearly in this screening. I heard people a couple of spots back from us in line to buy tickets, talking about the movie. The woman said she'd rather see a thirty year old film that she knew was good than "Lucy" which she heard was not. I've not seen "Lucy" myself so I will withhold judgement, but I can say that seeing "Ghostbusters" on the big screen was a good choice, and the price was a bargain at our theater, $6. It's going to play for the rest of the week, so you have plenty of chances to see it, don't blow the opportunity. I know it seems like you are paying for a commercial for the new Blu-ray release, but it's the best two hour commercial you will ever see. Just a thoroughly fun flick. At least the third time I've watched it this year. This is how you do comedy. So often, comedies are funny for their time (honestly, more often they're not funny at all), but they don't carry over. Only a select few remain funny year over year and decade over decade. Ghostbusters is still as funny now as it was when it first came out. It's also just as funny on a tenth watch as it is on a first watch. I don't know anyone who doesn't like it. Here, here. 30 years on and the humor hasn't really aged at all. good laughs are eternal I guess.